Costa Rica Weather - Get the most out of your vacations! Click here for an up-to-date weather forecast in Costa Rica! Although a small country regarding the land area, Costa Rica Weather packs a lot of variety between its Pacific and Caribbean shores. Costa Rica has all but two of the Earth’s climates. It doesn’t have the two most inhospitable climates for humans and wildlife, namely snow and frozen tundra and desert, but contains every other type of climate that exists on Earth! 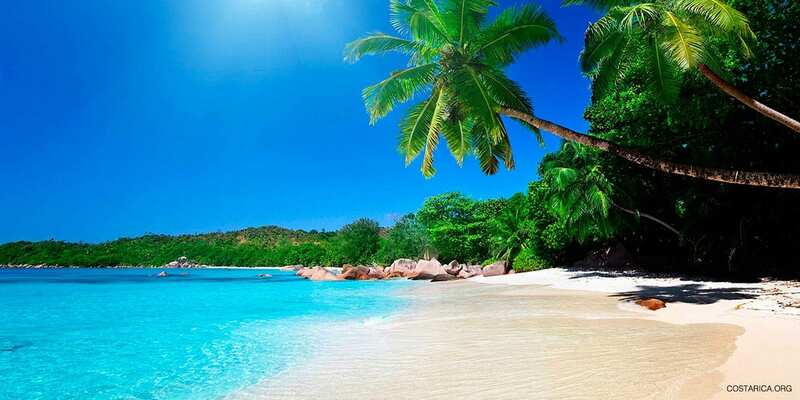 Costa Rica is thought to be a tropical country because it is close to the equator about 10 degrees to the north. Thus, Costa Rica has no winter season. Costa Rica enjoys mild temperatures all year ranging usually ranging from 70 to 81 degrees Fahrenheit although it is hotter on the beaches and temperatures can get up into the mid-90’s. The coolest months are November-January March through May are the hottest and most tropical. Average rainfall in Costa Rica is 100 inches, but the more mountainous rain forest regions can get up to 25 feet of rainfall annually. To put it more simply, weather in Costa Rica is usually defined as having two seasons: a dry season and a green season. The rainy season, also known as the “green season”, is an underrated yet glorious time to visit this country. This season is appropriately named after its emerald green landscapes but don’t be afraid, it won’t rain all day. On the contrary, the mornings are typically sunny all year round. The afternoon showers are a great excuse to relax in a hammock and read a good book. And usually, the rain comes in quick bursts of heavy rains that stop as suddenly as they start. This is a great time to travel Costa Rica, as hotel rates are lower. Moreover, vacation packages are more budget-friendly and there are fewer crowds. You are bound to find beaches and rainforest relatively deserted except for the rich wildlife. Animals love the rainy season! Sea turtles arrive at the beaches to nest and whales migrate along the coast to give birth. Some of the rainy season months are prime time for certain seasonal activities like turtle nesting tours, whitewater rafting, and whale watching near Dominical and Drake Bay. With everything drenched in tropical rain, the entire country is lush and verdant. Even the dry plains of Guanacaste turn green. So don’t be afraid if it gets rainy since it will make everything come alive. The main reason for the broad diversity in Costa Rica weather is due to several interrelated factors. The first lies in the fact that Costa Rica has the vast Pacific Ocean on one side and the Atlantic-fed Caribbean Sea on the other and they are relatively close neighbors and share the trade winds. For example, Guanacaste on the Pacific has a dry climate and tropical dry forests, while Tortuguero on the Caribbean is the humid and wet weather for a lot of the year, and yet the two regions are only 130 miles apart! Another factor is Costa Rica’s rugged topography that goes from mountainous high elevations to below sea level. Another factor is its active volcanoes that can affect weather patterns when they erupt and spew ash and lava. The dry season is essentially Costa Rica’s summer and the country’s peak period for visitors and tourism. You can bask in 12 hours of the sunshine per day, perfect for outdoor activities and adventures. The Central Valley is blessed with eternal spring with an average daytime temperature of 75 degrees Fahrenheit. Along the coastlines, the temperature can easily reach the mid-90’s, but evenings are cooled down by fresh sea breezes. While you can leave your umbrellas at home, most tourist attractions will be much busier at this time of year, especially during the holidays. Ask one of our travel coordinators for more information and recommendations to build your perfect vacation to Costa Rica! The whole of Central America has similar weather conditions and similar weather issues. Warm water currents in the Pacific Ocean influences weather patterns in Costa Rica and around the world. This phenomenon is called El Niño. Cold water and the accompanying weather patterns are referred to as La Niña. Costa Rica has had some difficulties in the past with either extreme drought or heavy rainfall. From 2015 through 2016 El Nino created a terrible drought in Costa Rica while El Nina caused rains and floods in various locations throughout 2017. 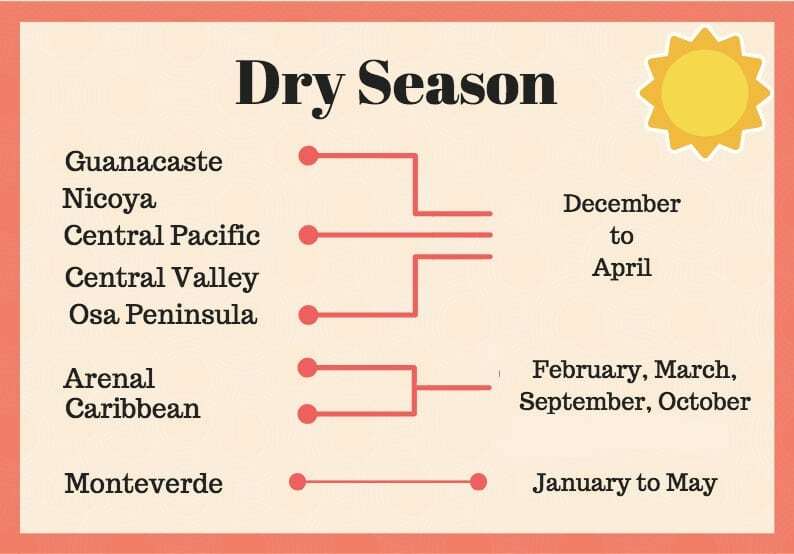 The former is very dangerous for areas like Guanacaste and Nicoya Peninsula because the weather here is typically already very dry compared to other places in the country. It causes forests fires and severe water shortage. The latter, on the other hand, can cause many problems in the Pacific South and areas like Osa Peninsula where rain is more common and floods tend to happen even outside of the wet season. During most of the year, the weather on the Atlantic coast (more often called the Caribbean coast) is wetter than in the rest of the country. However, in September and October, which are the rainiest months in the rest of Costa Rica, are the best months to visit Tortuguero and the Puerto Viejo areas because it is when the Caribbean side has its “Summer” and enjoys some of its sunniest weather. The climate in this region is unpredictable, but February and March are its driest months. Don’t let the possibility of rain deter you though, as nearly all the great tours and activities on the laid-back Caribbean side can be enjoyed rain or shine. 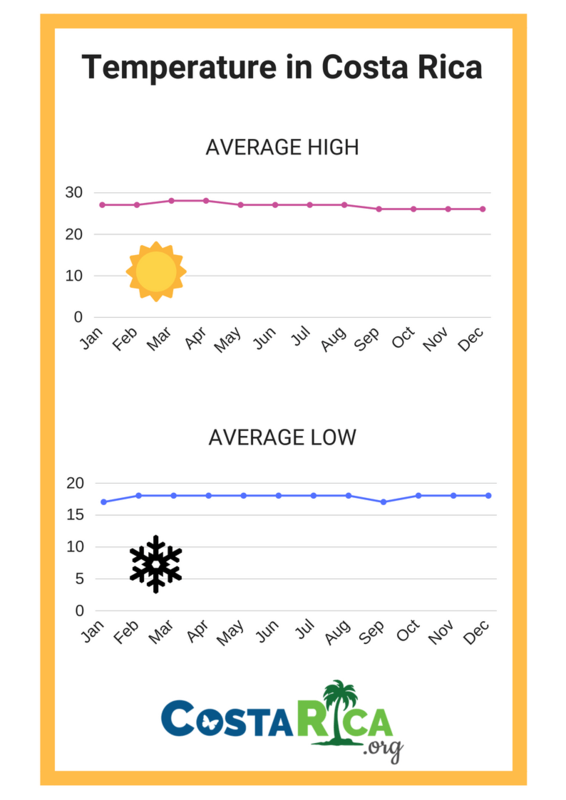 These graphs show annual temperatures in Celsius. Keep in mind that these are average numbers, which can vary from destination to destination throughout Costa Rica. 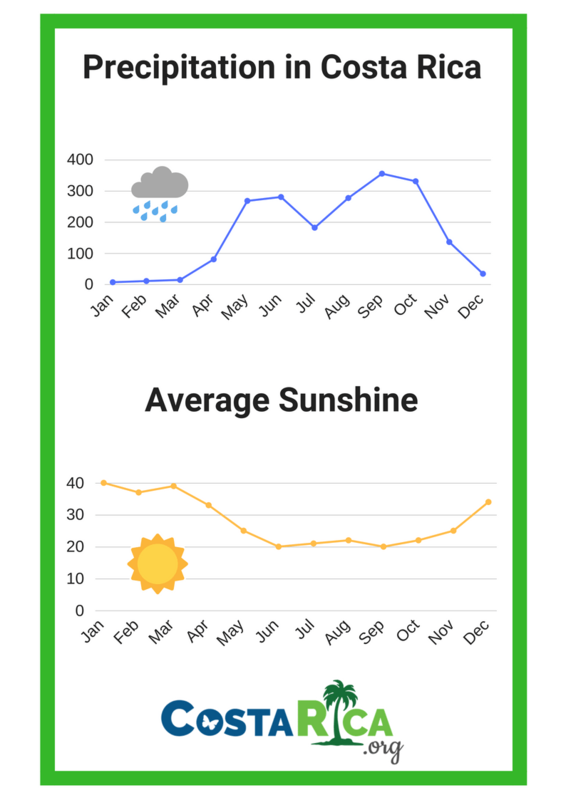 These graphs show the average, annual Precipitation in Milliliter and Sunshine in Percent of Costa Rica. 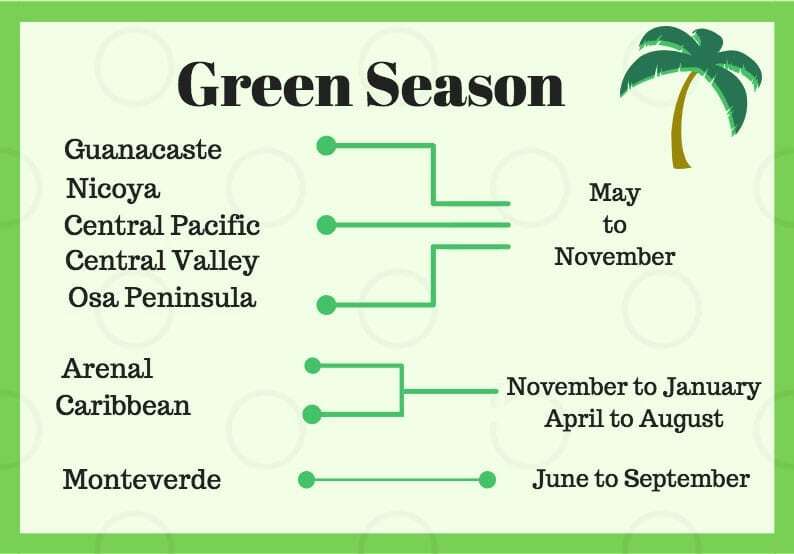 So, when is the best time of year to visit Costa Rica regarding weather and climate? This is one of our most frequently asked questions, and the answer is: Costa Rican weather is fantastic anytime! The perks of traveling during the green season are numerous, and while the dry season may mean bigger crowds and more costly lodging, the lure of warm sunshine overrides any negatives. The Central Valley has the best climate in the country with mild temperatures all year that average a temperate 79 degrees Fahrenheit (26 Celsius). The highlands of the Central Valley are cooled by coastal breezes and average about 55 degrees Fahrenheit (13 degree Celsius in the cloud forests). Get more information on the Best Time To Visit Costa Rica!